(Personal note: I’m thrilled to announce I’ll be doing geopolitics full-time now, having accepted a position at Stratfor. That being said, I don’t exactly know how Geopolitics Made Super, my baby blog since 2013, will fit into this new life. So this will be the last update until I sort that. That doesn’t mean I’m going to necessarily shut the site down; I just don’t want this to become a busman’s holiday. Thanks to everyone who has been a fan, a supporter, a sharer, a fact-checker, a corrector, and a critic. I’ve learned so much from doing this and am beyond pleased I now get to make it a profession). Trump campaign people are going to jail. This isn’t quite the fall of the Trumpian house of cards. Manafort’s indictment is very specific to him and his work in Ukraine. More information must come out before we can be certain this will lead to the White House. While the revelations of George Papadopoulos create the strongest link yet, they have not produced an indictment to date. Yet there is an essential tale here: for the first time in modern American history, a foreign power has substantially interfered with a political campaign. It’s not that others haven’t tried: the Soviet Union tried several times to back favored candidates, especially in the turbulent 1960s and 70s. But in those Cold War cases, American candidates refused the help. This is the first time it looks like someone said yes. At least three things. First, Americans grew ever more culturally and politically polarized, seeing politics as zero-sum and seeing one another as enemies. Second, Americans en mass gave up on their own institutions that used to guard the gates against outside interference. Finally, Americans decided that to restore institutional order on their cultural terms meant utilizing any means necessary to win elections, up to and including using foreigners to gain leverage at home. The culture wars themselves are a cyclical part of American history, occurring every four generations. The most famous cycle was the Great Awakening in the 1730s and 40s, a time of Christian Protestant religious revivalism. Another Great Awakening happened around 1800-20, once more religious in nature. 60 years later, a Third Great Awakening brought about political populism and social activism. Finally, in the 1960s and 70s, the 20th century’s most recent Awakening sparked increasingly intense clashes between liberals and conservatives. This modern Awakening has now come to a head. Since 1994, Pew has tracked a steady polarization of American politics as the middle ground wears away. A once-mighty middle slides towards an ever-more polar Left and Right. With a weak middle ground, fewer and fewer voters wanted to vote for centrist politicians or engage with mainstream media. A self-fulfilling prophecy took hold: the less centrists in media and government were rewarded, the more both sides saw the extremes gaining power and reacted by becoming more extreme themselves. That’s exactly what’s happened in the age of Trump: the Left has taken marked turn since his election. Escalating extremes have forced people to choose sides. Which in turn undermined faith in institutions overall: only echo chambers, small and fragmented, were seen as trustworthy. From the 1960s until now, faith in government has slipped ever lower. Even breaking it down for generations and partisanship, the slip is across the board. That’s also been the case for media. From 1997 to 2017, Gallup showed the same thing. It was like a set of dominoes. The Awakening’s culture wars sparked a distrust between Left and Right; as the two sides jostled for power, it undermined faith in the government, driving them further apart; this distrust spilled into media, making it ever harder for the United States to make rational decisions or counteract disciplined foes. That’s exactly what the Russians exploited. Russian intel, as well as more mainstream Russian outlets like Russia Today and Sputnik News, helped propel a domestically-generated narrative that mainstream media was untrustworthy. It relied on the whatabouttism and cherry picking already utilized by conservative and liberal echo chambers developed by Americans. We now know they inflamed racial tensions wherever possible. Russian-linked accounts tried to “turn up the volume” on both sides of the NFL kneeling debate. They produced a “Blacktivist” Facebook page to accentuate isolated cases of racism against African-Americans. They bought pro-gun and anti-Muslim ads while simultaneously funding leftist online campaigns. None of this was designed to help either side win the American culture wars. Rather, they wanted to drive them apart enough to make cohesive geopolitical thought difficult. If the Americans were so busy tearing each other down at home, they would be less capable of making strategic decisions in Syria, Ukraine, and elsewhere. It’s not that the Russians did – or could – swing the election to elect a puppet president. In a country as developed, as large, and as powerful as the United States, that’s an impossible task. Instead, Moscow wanted the United States distracted for as long as possible. With Trump, it succeeded beyond their wildest expectations. Russian intelligence services must have been just as shocked as many journalists as Trump barrelled through virtually every political taboo in the American book. Instead, as Trump’s election campaign went on, Russian intel continued to pour fuel onto the fire that seemed to sustain him. Even though Trump wasn’t quite a Manchurian candidate, he was certainly what Russian intelligence wanted. Trump openly questioned NATO, rattling European allies to the delight of Moscow. He has yet to implement the Congressional-imposed Russian sanctions package related to Ukraine. He may yet waste valuable American power picking a fight with Iran, or start a major conflict with North Korea. In Syria, he’s outsourced the war to generals interested in only defeating the Islamic State, not in rolling back Russian power or beating Bashar al-Assad. The culture wars produced a “win at any costs” mentality for both sides, but the Republicans were more adept than the Democrats. That opened the door for Manafort’s advancement, with his unscrupulous nature sniffing out short-term gains wherever he could. While Cold War Republicans once obsessively purged anyone with ties to Moscow, by 2016 many in the GOP were ready to embrace Putin if it meant defeating Hillary Clinton and her liberal allies. It wasn’t just the GOP, however: plenty on the Left were ready to embrace whatever Wikileaks dump or anti-Republican Facebook ad that affirmed their worldview. That approach made it hard for voters to understand some of the information geared towards them was false. “Fake news” was only fake if one chose not to believe it. Manafort’s indictment is proof enough that Russian influence reached deep into the American political system. The confusion, political tribalism, and social jockeying of the culture wars produced an environment where that was possible. This is conduct unbecoming of a superpower. If outside powers can distract the United States so readily, it will invite both more interference as well as disastrous decisions. American politicians used to be mostly immune to foreign influence; now, they appear far too willing to take whatever help they can get, regardless of the motives of the giver. That cannot last. The backlash to Russia’s interference has incensed the American Left, yet it’s unclear that they would have been above the same offer had Moscow come calling. Instead, institutions across the United States have to do the hard work of rebuilding their reputations and imposing standards. That’s starting to happen: the wild days of YouTube’s conspiracy cottage industry seem to be largely over. Additionally, if the GOP fails to accomplish much legislatively, it may be proof that the winner-takes-all attitude of the party does not produce substantive results. The fire and fury of Awakenings run out of energy; so too will this one. For the United States, that cannot come soon enough. Congratulations on the position, your writing has been a great inspiration for me to try to follow a similar path. I look forward to continuing to see your great work in the future, on this platform or another. Thanks for your support and all the time you’ve spent here! As for the article itself, I am intrigued by the difference between previous “Awakenings” and the one you mentioned we are seeing now. What interests me about the comparison is that fact that the previous ones were religiously themed and inspired, whereas the conflict in the U.S. these days is not primarily between religious parties. I would appreciate it if you could shed some light on why this would be considered an “Awakening” and not perhaps some new or different type of phenomenon. Thanks for reading all this time. I hope I’ve helped you see the world just a bit differently! As per the Awakening, some social historians do see this most recent one in religious terms: there was, after all, the Moral Majority, and much of Trump’s base is Evangelical. The bathroom rights squabbles, marriage equality, and the “war on Christmas” could all be seen in this context. That being said, I also think it’s been modernized, just as the Progressive Awakening of the late 19th Century was, to include social issues that have arisen that Protestantism doesn’t necessarily have a clean answer to – the challenge of immigration, the Rust Belt decay, the opioid crisis. The struggle remains over the moral center of the United States – after all, it doesn’t seem to faze many Trump supporters that the border wall is not terribly practical. It’s more about the moral message of closed borders, the symbolism, that a technocratic, pragmatic approach to society. A loss to all of us who can’t be bothered to pay hundreds of dollars per year for geopolitical analyses, but I will still congratulate you on your new career. I’m kinda hoping against hope that this site doesn’t become just “living dead” without any further updates, but I totally get the busman’s holiday dilemma. Good luck to you nonetheless. Thanks so much for your support. I get the sticker shock, though they’re moving in the direction of becoming priced like The Economist (another, admittedly, rather pricey but worthy read). Congrats on the new position at Stratfor! Looking forward to following your writing as it shifts mediums. 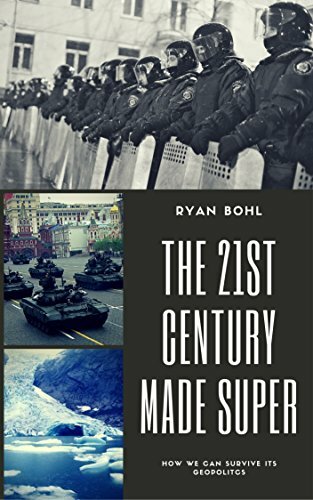 Coincidentally, just finished The 21st Century Made Super the other night. Loved every chapter of the book and have enjoyed every article posted on the blog. Your writing has helped to shape my worldview and I have always appreciated the lens through which you tackle geopolitics. Best of luck moving forward. Thanks so much for your kind words and support! Do leave a review so others might stumble on it if you don’t mind! Congrats Ryan! Good analysis over the years, you deserve the job! Congrats on the new job Ryan. 1) I agree with you that what we are witnessing here is an awakening; a cultural awakening though – no “New Divinity” is being proposed. 2) Earlier awakenings have left a lasting mark on American Society. What do you this one will leave us with? 3) The Russians might have indeed meddled in our election, but would it have mattered? As far as I can see, its a binary assessment; you can’t point at Russian success AND highlight the triumph of the awakened in the same sentence. Correlation doesn’t mean causation. 1). I agree on that point that we’re not making a religious turn, though we are restructuring our national belief system and cultural core. That seems likely to involve a shift away from organized religion. 2). My guess is that much of the country will shift towards a compromise between some heartland and coastal values. Marriage equality and sexuality will be rationalized and evenly understood, while I suspect that the coasts will have to abandon much of their current views on more open border immigration and multiculturalism for stricter migration flows and a new national set of values that encourage assimilation. I also suspect we’re about to see another era of a Big Government in the 2020s. As the attempts to allow the market to lift all boats has seemingly failed, both Left and Right are becoming more amenable towards redistributive policies that restore the middle class. It will be telling if the GOP can pass this new tax bill; I suspect they will fail since the GOP Establishment no longer understands their own voters. 3). I personally don’t suspect that Trump won because of the Russians. What is critical is that American politicians and campaigns are now actively seeking foreign support to defeat domestic rivals. That’s a dramatic shift and implies we have a dangerous weakened national core. I’m not sure what you mean by the “triumph of the awakened” however – what I meant to get across is that the Russians have taken advantage of our Awakening-driven division to effectively deploy active measures against the U.S.
We are in the midst of a secular crisis at the moment. If you think of an awakening as a secular “summer”, then we are in a secular “winter” right now. The awakening we went through in the 60-70’s set the stage for all of what we are seeing now since it split the dominant Boomer generation in two. Until we figure out whose values (Left, Right, combination) we want our civil society to follow, the conflict will not end. Hopefully, we do not get into a shooting war because of it. Congratulations, Ryan, on the new position!! This has been a wonderful blog to follow. Ryan, congratulations again. Look forward to reading all your stuff on Stratfor, and comparing it Zeihan and Friedman at Geopolitical Futures. On that note, this is the latest deep dive from Geopolitical Futures on Saudi Arabia. I know you might not be watching this blog, but please give it a look. It is about 10 pages long, and I find it agreeing with almost all your points over the years. Thanks very much for that link. It’s great to see that I’m not the only one coming to these conclusions – and perhaps that explains the rapid moves of Mohammed bin Salman, as he and his advisors also the same writing on the wall and know they don’t have time. Alas, I’m not optimistic they’re making the right calls: Saudi needs political reform at home just as much as it needs external security and economic change. I suspect, however, that’s the last thing they will do. “for the first time in modern American history, a foreign power has substantially interfered with a political campaign”. This is the very type of opinion that has and will continue to lead to increasing low trust. It’s a false comment and reads as blatantly politically self serving. Aside from the myriad of open contradictions inherent in a Trump focused investigation of an election wherein foreign-power invested news organizations had avowed public opinions on the election that were counter to Trump interests (ie: Al-Waleed bin Talal ties to Newscorp, not to mention Clinton Foundation Donations), we can go back to every election and readily find copious foreign interference. Should we count the 2012 election cycle release of the Saudi funded movie Promised Land as election interference? I’d say that it had a larger public message than targeted Facebook ads ever could. You’ll never make an honest point by claiming that this was a “first” in terms of supposed election interference. Of course, any actual “interference” being dependent on actual impact. Making that point will necessitate that you impugn the free agency of American voters. Good luck with that. This so called “interference”, and your defense of it, reads simultaneously as particularly weak political positioning. Which leads to low trust and a continuing disintegration of he commons. Which will continue to deliver the political results that you are observing. The only way that this investigation returns a positive result for this nation is if it returns an honest accounting of the problem and its past effects. Do you believe that is likely? “Even though Trump wasn’t quite a Manchurian candidate, he was certainly what Russian intelligence wanted”. Really? Because his actions in the ME don’t reflect that reality, unless we are to believe that a faster pace toward subduing Iran is what “Russian intelligence wants”. The monumental and now-effective push toward Saudi liberalization being key to that process. Or don’t you understand why that is? From where I’m sitting, according to the donation record, Clinton was in he pocket of the Wahhabist-supporting faction of Saudi politics that was always more reluctant to give up Iran due to the perceived increased overall threat from the West as a result of those politics. After Trump was elected, that faction was sidelined. The fulcrum is in the region where its always been. The Obama WH was clearly soft at that fulcrum, to Russia’s benefit. Trump had nothing on Clinton in terms of commitments to Russia. Moreover, Russian “supertopsecretelectionruiningoperatives” posting facebook ads and apparently organizing rallies also did so against Trump. There is a lot of noise surrounding domestic and international politics, but one can cut through the smoke and mirrors by focusing on the fulcrum. In doing so, Trump comes out as Russia’s enemy and Obama-Clinton its friend.